I've always loved a cool and creamy rice pudding, but wanted to indulge in a healthier version like this one! Cook the rice in the water for 20 minutes or until the rice has begun to soften. Strain. In a large pot, bring to a boil the almond milk with the cardamom pods and cinnamon, over medium heat. Add the parboiled brown rice and the raisins and boil for 30-40 minutes until thick and soft. Remove cardamom pods and add powdered cardamom and syrup, and continue cooking 5-10 minutes longer. If it's too thick, add more milk; the consistency should be creamy but not gloopy (will thicken a bit more as it cools, as well). Stir in ghee and remove from heat. Serve with a sprinkling of cinnamon sugar. Combine 1/2 tsp ground cinnamon with 3 to 4 tablespoons of organic cane sugar. A great treat for VATAS and PITTAS though KAPHAS should minimize the use of sweeteners (omit cinnamon sugar, just sprinkle with cinnamon or cardamom powder) and could replace the brown rice with millet or quinoa. That looks delicious! I will definitely try. I will use soy milk instead of almond milk. Oh fantastic! I've been craving rice pudding for a while now and this looks perfect! It always brightens my day when I see a new post from your blog on my reader. Thanks! Rice pudding is one of my all time fave desserts...I can't wait to try this one. I'm a big fan of the ingredients you used! Good to know that it is good for health I have ointrodiuced brown rice to my diet lately. I just discovered your blog and really am impressed! I hope even if you don't add any new recipes, you keep these up here. This year I did a supervised detox and food intolerance testing and am looking for more dairy-free and wheat-free recipes now. Yours look awesome. Thanks for offering this great information. I’d like to personally invite you to join the CookEatShare Author network. On November 28th, 2009, I began indexing your posts and enabling CookEatShare.com visitors to find them. CookEatShare has had over 2.5 million unique visitors in 2009, and I think they will be interested in your content. Users are being guided to your actual blog, so this is a free way to increase page views and visitors to your site. Please contact me at mary@cookeatshare.com to get unique link to claim and customize your profile or request one at http://cookeatshare.com/featured-author. Yoga (Sanskrit, Pali: yóga) refers to traditional physical and mental disciplines originating in India. The word is associated with meditative practices in Hinduism, Buddhism and Jainism. In Hinduism, it also refers to one of the six orthodox (astika) schools of Hindu philosophy, and to the goal toward which that school directs its practices. In Jainism it refers to the sum total of all activities—mental, verbal and physical. Major branches of yoga in Hindu philosophy include Raja Yoga, Karma Yoga, Jnana Yoga, Bhakti Yoga, and Hatha Yoga. Raja Yoga, compiled in the Yoga Sutras of Patanjali, and known simply as yoga in the context of Hindu philosophy, is part of the Samkhya tradition. Many other Hindu texts discuss aspects of yoga, including Upanishads, the Bhagavad Gita, the Hatha Yoga Pradipika, the Shiva Samhita and various Tantras. That looks amazing! Great blog. Thank you for the invitation, Vincent. I don't update this site very often so don't think it merits the Petichef link. Thanks! I am bookmarking your post. Keep posting good stuff dude! Brown rice is a great source of minerals and vitamins. 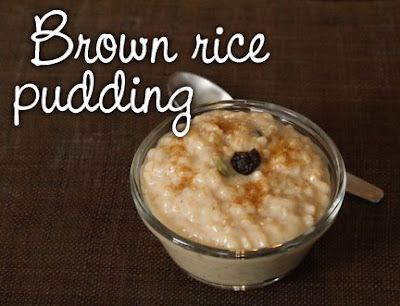 This brown rice pudding is really awesome. Thanks for sharing. Dosha Power to the people! I see that you’re interested and fascinated in food stuffs. This is awesome Brown Rics Pudding. You see, we have this food site Foodista.com (http://www.foodista.com) that is a food and cooking encyclopedia that everyone and anyone can edit. Maybe you are interested in sharing some of recipes to us or share your knowledge about food stuffs and techniques, or maybe you just like to write reviews about food, restaurant and recipes...why don't you visit us sometimes, if its food you're interested in, then we are interested in you. Don't hesitate to check us out. what is the address for your twitter and facebook page? No twitter or facebook, I'm afraid. Sounds Delicious! I think this is healthy too, with milk and brown rice in it. Nice recipe! Being an Ayurvedic Therapist myself, i wish more people will follow diets based on ayurvedic principles to avoid doshas and lead a healthy life. For more ayurvedic related advice and treatements in The Netherlands, please visit our clinic near Amsterdam. For more details visit our website, http://www.prakruthi.nl. I am really looking forward to trying this recipe, my grandma used to make this when I was little and I have not been able to find a good recipe since then. I like that recipe and thanks for posting it. Good to know that it is good for health Oh, I will try that for sure! May I please include one of your recipes and its photo in our yoga school's monthly newsletter? I'd like to share ayurvedic recipes and it would be easiest for us to direct our members to your delicious site. I just love rice pudding. But this is in a class all its own. Good job. Great Vata/Pitta recipe though Vata people may want to indulge in warmer weather. Fran may we feature this recipe on our web site's recipe section? where have you gone?!?!?! i need more posts from you please! You continue making dishes like those and addict us to become gourmets. I do like the cinnamon flavouring you have favoured. Wow its appetizing. definitely i will try this healthy pudding. I have discovered your fabulous rice pudding recipe some time ago and have enjoyed it again and again, with brown rice, millet or quinoa - it's always delicious! Now I was wondering whether it might also work with farro - do you have any experience with it? I cooked it at home once, it was not good. But I will try your recipe. I hope I will make good this time.